There is a castle. It is overgrown, looking like a rotting stone log jutting out of the ground, once an independent lifeform, now decaying into the earth. But there is human life here yet: simple, traditional, natural life. They are people who also sink into the decay of earth and ages, like a rapture for ancient nobility, a slow process of being warped and twisted by the machinations of time. We are whisked away for the length of this album, possessed by the ghost of that lost castle. This is another release which comes from Russia, where the interest in dungeon synth seems alive and well. This is an album which gets the formula exactly right, but also introduces a very distinct and unique vision of dungeon synth in the process. You almost feel like you're there, amidst the cold, rotting stones. You can sense the terrible, horrific things going on in the immense torture chambers below, and feel grateful each day that you have food, a bed, and are not condemned to those depths. But though this might be the castle of a tyrant, a decaying fortress sinking into the earth, there is still great majesty and regality here. I think this is particularly present on Targenur. The great string tone almost sounds like castle gates going up and down. You feel the immense and glorious display of power this is, coming in off the wild trails of nature into a legendary fortress of pain and order. My first listen of this album, I was initially put-off by what I perceived to be another "noble savage" kind of dungeon synth record, one that is simple both in voice and vision. However, I quickly learned that Skarpseian is one of the exceptions channeling this level of simplicity. From what I can tell, this is a calculated minimalism. While such a thing is not uncommon in dungeon synth, what is unique here is that it seems both self-aware and also pure. What I mean by this is that it feels authentic. It doesn't feel like it's intentionally "dumbed down," but rather that it's conjuring these ancient feelings in a way that is simply primitive: a direct, straightforward voice. A hard feat. Though the voice is straightforward, the message and atmosphere are cyclical and spiraling inward into oblivion, a hazy stupor of life that fades before it's even realized it'd begun. It is an atmosphere with immense depth. The sound of the synths here are brilliant. Each of them seems to embrace the ugliness and uniqueness of discarded sounds from decades past. This allows for both the immediate feelings of decay, as well as seeing the flowers and mushrooms that bloom from such a process, the spirit of forgotten history. Skarpseian has a wonderful ear for which tones have something to offer apart from being vintage, that they each have their own beautiful unheard voice, and the artist expresses them very raw and confidently. This has a tremendous effect, making the work seem both primitive and distinctly noble, naturally a perfect vibe for the concept of a "shadow castle." And something must be said of the album art. I'm personally not sure whether it's new or old, well-known or original, but it fits fantastically with the sound of the music. It has all the misty atmosphere, the overgrown/decaying quality, the cold-looking land on the horizon, the tinge of greenish-brown earthiness, and the two black figures on the bridge, completely opaque, showing the presence but insignificance of human life in this vision. All the major points in the music can be found by studying this art while listening, which should be the ideal goal of album art. I've listened to this work a handful of times already, and it's grown on me more each time. This is an album which is very focused on the vision, and because of that it's able to go much deeper than most dungeon synth I've listened to. This album might rival some of the best, assuming it holds up on further listens. I've been listening to this over at Bandcamp prior to your review and must say that I mostly agree with your assessment. Funnily enough it was the cover-art that first drew me too it! At the end of the month I shall certainly be purchasing it. Glad to see some activity in the dungeons again. Thanks for bringing this album to us. I've listened it online and I understand what you found in its music. On further listens this album has not only held up but grown in beauty. Definitely best dungeon synth album of 2013 so far. Thank U for the support, guys! 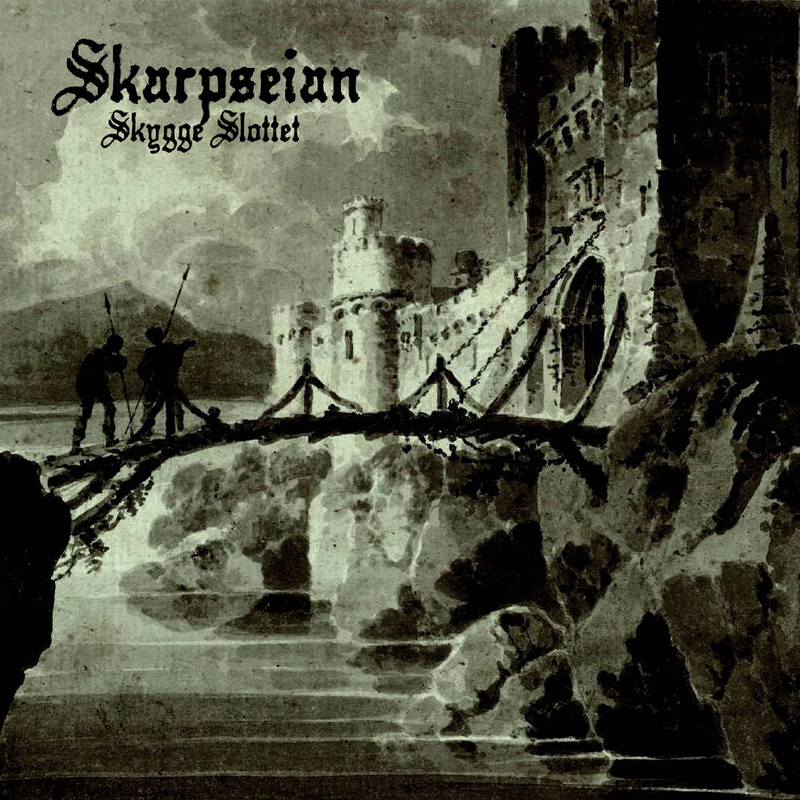 More albums of Skarpseian are to be released!